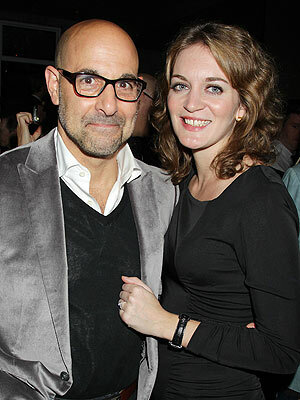 In the game of love, the odds are ever in Stanley Tucci's favor: The Hunger Games star quietly wed Emily Blunt's sister Felicity, his rep confirms to PEOPLE. Although hesitant at first, the actor, 51, verified they've tied the knot to New York's Daily News while at a screening of Meryl Streep's latest film, Hope Springs. Less than a year since news of their engagement broke in November, Blunt, a London-based literary agent, wore double-bands on her ring finger, the News reported. Tucci, too, wore a special corresponding accessory on his hand. It's a happy ending for Tucci, who has three children with his late wife Kate, who died in 2009 from breast cancer. And their nuptial bliss may not be over yet: The newlyweds will exchange vows again in a sequel ceremony with friends and family, Tucci has been saying.